Find the new bulb you need from Projector Lamps Canada by using the two drop down lists below. You can find more information and instructions for finding your lamp on this page, below the drop down lists. Finding the lamp you need on the Projector Lamps Canada website is easy. First of all, choose the brand of your projector or TV from the first drop down list below, on the left. The brand of your projector or TV is the company that makes it, for example Sony, Panasonic, Dell or Hitachi. After you have chosen the brand of your TV or projector from the first drop down list, you can then choose your projector or TV model from the second drop down list below, on the right. The model of your machine will usually be marked on it. If you can't find it here, you will be able to find your projector or television model number in the owner's manual that came with your machine. After you chose the brand and model of your TV or projector, the Projector Lamps Canada website will automatically load a web page containing details about the replacement lamp you need. You can then choose the quantity of this lamp you want to buy and then add the lamp to your cart. If you are unsure of the model number of your projector or TV but you know the part code or product number of the replacement lamp you need, you can find the lamp on the Projector Lamps Canada website by using the "Search for a lamp" box towards the upper right of the website. Simply type in the lamp part code you are looking for and click "Search". 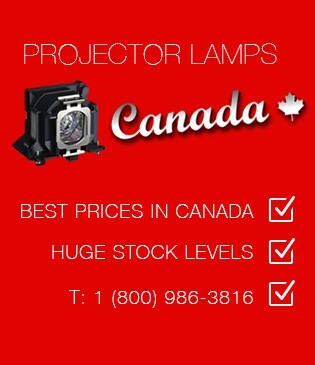 If you have any difficulty finding a lamp or bulb you need, simply email the Projector Lamps Canada customer support team at info@projectorlampscanada.ca, or head to the Projector Lamps Canada contact page for more contact details.